We knew this was all but finalized, but now we have the official word that the deal has closed. 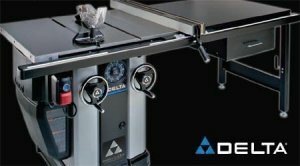 (Anderson, SC, February 7, 2011) – Delta Power Equipment Corporation announced today that its deal to purchase the DELTA® brand of woodworking equipment and machinery from Stanley Black & Decker closed on Friday, February 4, 2011 as expected. A wholly-owned subsidiary of Chang Type Industrial Co. Ltd., a Taiwan-based manufacturing company (Taiwan Stock Exchange symbol: 1541.tw), Delta Power Equipment Corporation is based in Anderson, South Carolina. This new location will continue the Made in USA tradition of designing, manufacturing and marketing the world class UNISAW®, radial arm saws and BIESEMEYER® accessories. "We are right on track with our transition plan and expect to begin moving machinery and equipment from the Jackson, Tennessee location very soon," said Bryan Whiffen, President & Chief Executive Officer. "We expect to have the Anderson facility fully operational in April. In addition, I'm pleased to announce that Alicia Hicks has been named Marketing Manager for the organization and additional staffing is well underway." Delta Power Equipment Corporation is located at 5530 Airport Road, Anderson, SC 29626. Their phone number is 864-231-5888.